Have you ever wished you could just shrink down your Bravia television so that you can display your photos on it every time? 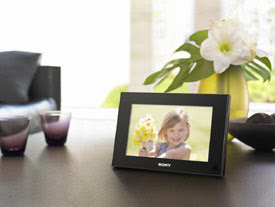 Well, you can stop wondering since Sony has released their first ever digital picture frame, and one of them is their 7 inch high end digital frame, the Sony DPF-V700. The Sony DPF-V700 will be available throughout Europe in May and will be a good home accent for Sony fanboy/girls alike whose homes are already laden with Sony products.